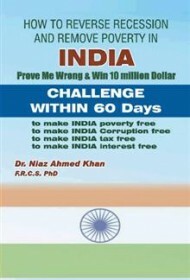 Niaz Ahmed Khan presents a plan to unleash the economic power of India in his book How to Reverse Recession and Remove Poverty in India. Khan states his lofty goals on the front cover: to make India poverty free, corruption free, tax free, and interest free. The means to this end is Khan’s MBCS (Mutual Benefit Bond System)—a bit of a misnomer, since the “bonds” are really more like vouchers or an alternate currency. These bonds are offered at a discount to the public in order to “pre-load” the government’s coffers, and the purchasers can then use the bonds to exchange for goods and services. Khan’s MBCS ideas here are similar to his other books, How to Restore the Greek Economy and How to Reverse World Recession in Matter of Days, but India poses some unique aspects that the author doesn’t always fully discuss. One that goes largely uncommented upon by the author is the fact that an economic system that doesn’t charge interest, such as Khan’s, would be compliant with Islamic banking, or Sharia law, a potentially important fact to mention regarding a country where Muslims make up a significant minority. Like his other books, Khan’s India entry offers plenty of food for thought, but it also contains some flaws. Instances of strange syntax or typos—“barrowed money” instead of “borrowed money”, for example—detract somewhat from the book’s readability, but are not so significant as to obscure Khan’s message. With plenty of examples, Khan passionately makes his case for MBCS. Khan’s book will appeal to a niche audience, rather than a wide swath of readers. Those passionately interested in economic theory may find some enjoyment and intellectual stimulation in these pages.